This entry was posted in Family update, Stella's eyes, vision therapy and tagged accommodative esotropia, amblyopia, anisometropia, disneyland, sensory processing, strabismus, vision therapy. Bookmark the permalink. 13 Responses to Something Amazing Happened at Disneyland. That is all so amazing Amber. It sounds like huge developments in Stella’s vision and brain! We have taken Amanita to a few 3d movies. She doesn’t like the volume or the scary scenes. I don’t think she sees them in 3d. I think she is alternating eyes and sees flat. The experience you describe about the interactive 3d game/ride made me remember something I read about vision and motion. It might have been from the book, The brain that changes itself. It was saying that for vision to develop completely, the body needs to be in motion. Thanks for sharing! Hi Karen, thank you so much. Stella can do this–that’s what Disney reminded me. I’m impressed that Amanita makes it through the movies despite not being able to see them in 3D. Stella just couldn’t tolerate it and got very upset–and it was a movie she’d already seen many times! So funny you mention that book–I have it and am halfway through… will need to revisit and finish… you’re right, it really is so applicable to VT. Thanks for your comment! Thank you for your post! 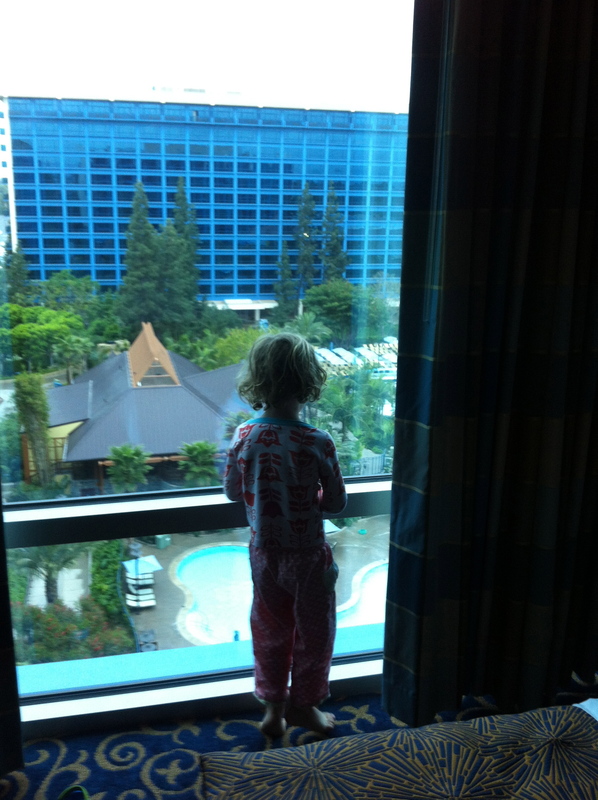 And such perfect timing…we are anticipating our next trip to Disney the first week in August. Your post made me realize that this will be sweet Kathryn’s first visit since discovering her vision and sensory problems. Your anecdotes made me recall all the terrifying sights and sounds she had to endure in the past (we made it through the scary and, in true Kathryn fashion, her Disney memories are some of her fondest). I’m excited to see how this visit two and a half years later will compare to our other 3 visits. Since our last visit her strabismus and resulting amblyopia have been corrected with her magic prism lenses. We continue to work on integrating her primitive reflexes, building her core strength, working her auditory and visual systems, and continuing schooling over the summer. It is such a comfort to know that there are other parents, like me, who tirelessly devote so much to improve their child’s livelihood. You are making a difference in her life and I understand your motivation. There is no choice about it…it must be done. I’m so pleased Stella is embarking on the next level of understanding. I wish you many more moments of success! Wow, you’ll be in Disney so soon! Excitement! We are already counting down the days to our next trip. Stella’s optometrist helped us understand the effect of the ride on Stella and said “You’ll have to go back!” So now Stella keeps saying, “Dr. T says we have to go back to Disneyland!” Major points scored by Dr. T in Stella’s eyes. Kathryn sounds very resilient, and she has come so far! Disney really has magic and I hope to read about your trip–I bet it will be incredible, so let me know if you post something about it! I absolutely know the type of clinging you mentioned. I’m so heartened and impressed by your daughter’s progress, and by your dedicated efforts as well. We are on a mission and nothing will stop us! Looking forward to hearing of more successes, big and small, from you and your girl (prisms really are a miracle when used properly–I’m in awe). I’m a vision skills specialist in Arizona, and I thoroughly enjoyed this post! I’ve been following Stella’s progress via your blog entries, and am delighted to hear of her progress with her visual skills. What an exciting time for your family! Jennifer, thanks for taking an interest in Stella’s journey. I will keep you posted–we are totally determined and I know she can do this. She’s shown us–we just need to stick to it. Luckily, many of the exercises we’re doing now, she really enjoys. I hope we can keep it that way for the most part! Thanks again. Found your blog via Facebook. Love it! I wish I had blogged Zach’s journey as if happened, but I think I was so overwhelmed at the time I had no room for anything else. Hang in there. It gets better. Zach is 10. 6 months ago he explained to me that he used to see in 2D but now he sees in 3D. It took him over a year to process all he had been through and find the words to explain it. I had no idea he had been unable to see in 3D. I wish we had begun when he was 4 1/2, but he was 7 when he started VT, which he did for 8 months. You only see clues to the changes brought by her therapy by watching her behavior, but there is likely much more going on in her brain than you realize. I know how hard it is to rearrange everything so you can do daily therapy with your child. We have done it too. i have had to let friendships lapse when it was clear the friend did not understand why I sometimes canceled at the last minute. You are an amazing mom for sacrificing so much for this, and you won’t regret it. Stella is a very lucky little girl that she was born to you. I just found your blog and love it! Stella is very lucky to have you as a mom. I wish I had blogged my family’s experiences as my son, Zach, went through vision therapy. He started at 7 and did vt for 8 months. One day, more than a year after vt was over, he explained to me how he used to see in 2D but now he sees in 3D. I will come for Stella too. Maybe it already is. He explained to me that it was a gradual process for him. He is very farsighted and has convergence excess. He said he could see things far away in 3D, but things close up were flat (because his eyes would cross and he would see double, so his brain would suppress one eye). “The things far away only popped out a little. They started popping out farther and farther, and the popping out stuff started getting closer and closer, until now everything pops out really big.” As he went through therapy, I watched behavior and asked questions, but I never fully understood until that conversation. Hang in there. It WILL get better. The enormous daily sacrifices you are making will pay off. You are an awesome mom! Love this! A friend shared your blog. Blessings in the journey. Amber, this is great news! Very exciting to have such an unexpected breakthrough. Keep up the good work, Mama! Hi noticed you haven’t posted any updates recently. Just curious how is Stella’s progress? My 2 year old Daughter has been diagnosed with intermittent exotropia recently. The opathalmologist suggested we do 2 hours Everyday for 4 months before she reviews again. I’m curious if patching works at all. Have researched intensively on vision therapy as well. But still doubt if it’s truly useful. And surgery would be the ultimate last resort. I wonder how’s Stella now. Has vision therapy fixed her esotropia?